A Brief History of the Public Schools of Derby, Kansas. The first school meeting of District No. 6. was held at the house of John Hufbaur in El Paso at 2 p.m. April 6th 1872. At this meeting the district was organized, J. Hout Minnich elected, director; John Hufbaur, clerk; A. G. Burr, treasurer. 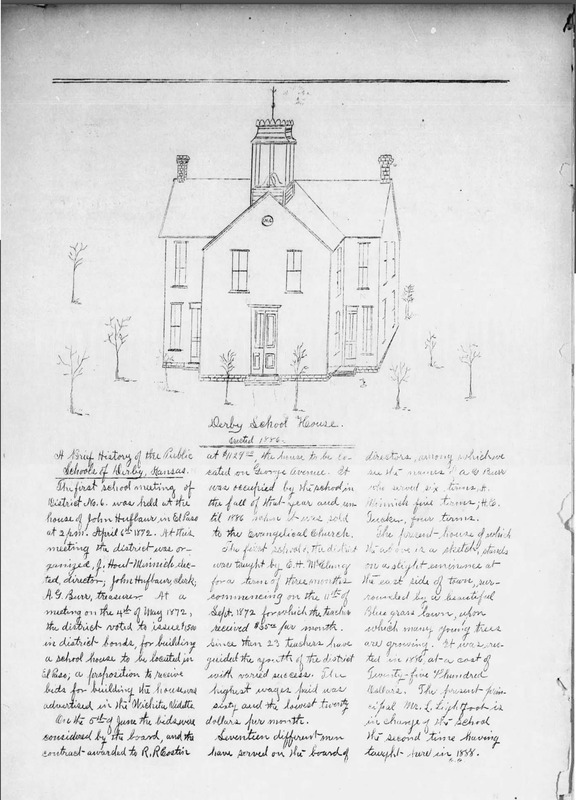 At a meeting on the 4th of May 1872, the district voted to issue $1,500 in district bonds, for building a school house to be located in El Paso; a proposition to receive bids for building the house was advertised in the Wichita Vidette. On the 5th of June the bids were considered by the board, and the contract awarded to R. R. Costin at $1129.00, the house to be located on George Avenue. It was occupied by the school in the fall of that year and until 1886 when it was sold to the Evangelical Church. The first school of the district was taught by E. H. McClung for a term of three months commencing on the 11th of Sept. 1872 for which the teacher received $35.00 per month. Since then 23 teachers have guided the youth of the district with varied success. The highest wages paid was sixty and the lowest twenty dollars per month. Seventeen different men have served on the board of directors, among which we see the names of A. G. Burr who served six terms; A. Minnich, five terms; H. C. Tucker, four terms. The present house of which the above is a sketch, stands on a slight eminence at the east side of town, surrounded by a beautiful Blue grass lawn, upon which many young trees are growing. It was erected in 1886, at a cost of Twenty-five hundred Dollars. The present principal Mr. L. Lightfoot is in charge of the school the second time having taught here in 1888. “Derby School House: A Brief History of the Public Schools of Derby, Kansas,” Derbykshistory, accessed April 20, 2019, http://derbykshistory.com/items/show/4.